Chex Mix is a popular snack for children and adults alike. The original Chex Party Mix is prepared using Chex breakfast cereal and has been a popular recipe for more than 50 years, according to Chex’s website. 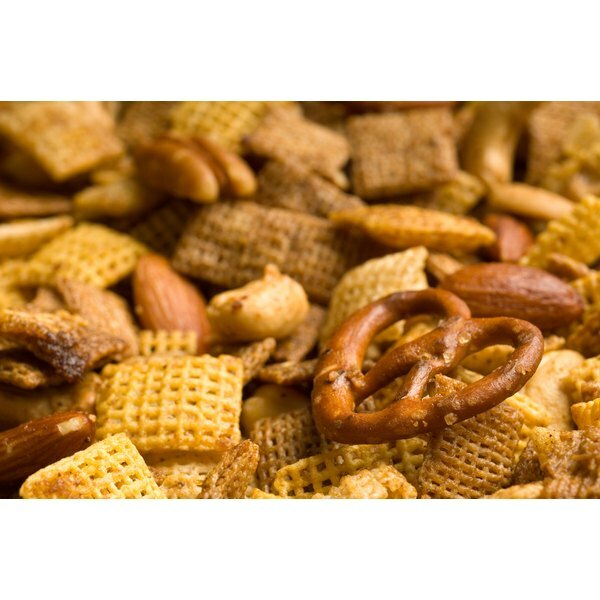 The popularity of Chex Mix has led to Chex producing a variety of packaged Chex Mix snacks, which vary in nutritional value when compared to each other and to the homemade version. The packaged version of Chex Mix is lower in calories than the homemade version. Homemade Chex Party Mix provides 140 calories per half-cup serving, while the packaged version of Traditional Chex Mix provides 120 calories per half-cup serving, according to Chex’s website. You could reduce the calories in the homemade version by using only 3 tbsp. butter instead of 5 tbsp. as the recipe suggests. The homemade version of Chex Party Mix is also higher in fat than the packaged version. Once again, this can be remedied by reducing the amount of butter you use. Each serving of the homemade version contains 7 g total fat, 2.5 g saturated fat and 0 g trans fat. Each serving of the packaged version provides only 4 g total fat, 1 g saturated fat and 0 g trans fat. According to Medline Plus, reducing saturated fat intake may help to reduce your risk of heart disease. The homemade version of Chex Party Mix is higher in sodium than the packaged version. Each serving of the homemade version provides 280 mg sodium, while the traditional flavor of the packaged version provides 210 mg per serving. Other flavors of packaged Chex Mix contain different amounts of sodium. The cheddar flavor, for instance, contains only 170 mg per serving, while the hot and spicy flavor provides 190 mg. According to the American Heart Association, diets low in sodium may help to reduce the risk of high blood pressure. Because the homemade version of Chex Mix contains fortified breakfast cereal, it is higher in vitamins and minerals than the packaged version. Each serving of homemade Chex Mix provides 6 percent of the daily value of vitamin A, 2 percent vitamin C, 6 percent calcium and 30 percent iron. The packaged mix is not fortified and contains only 2 percent of the daily value of iron. Chex also makes a Sweet n' Salty line of Chex Mix, as well as a few chocolate flavors of Chex Mix. The Sweet n’ Salty varieties contain more sugar than the traditional version, providing up to 8 g per serving, compared to only 2 g. The chocolate flavors are also higher in sugar, in addition to containing more fat and saturated fat than the traditional version.